Dog-Friendly, Beach Huts and a private beach for sunrises and sunsets: Lusty Glaze offers it all. Having visited Cornwall for the first time earlier in the year with Millie, my beach obsessed English Springer Spaniel, I’d been itching to go back. The standard of beaches and dog-friendly days out had me hooked… oh and they had some pretty great places to eat too! I hadn’t managed to visit Lusty Glaze on that first trip but with a contract due to come to an end, a friend (thanks, Sue!) sent me a link to their facebook page and I spotted that they were offering a discounted stay during November. 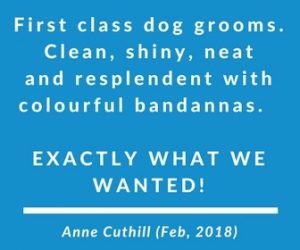 Having persuaded my friend Natalie and her lovely Jack Russell to join us for some much needed time out post both of us starting new jobs – we managed to book in 6 nights and another dog-friendly holiday was booked! 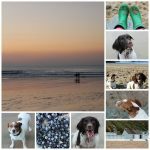 If you follow us on Instagram or Facebook, you may have spotted a few pics from those days – as most people are starting to think about holidays and I know how difficult it can be to find dog-friendly accommodation, I thought it was about time I shared my review with you! 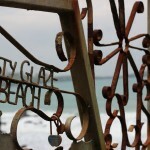 Down 368 steps from the clifftop, you’ll find a restaurant, several beach huts, beach cottage, chalet and some buildings. We’d hired the beach cottage as doors from one bedroom and the main living room open directly onto the beach. Whilst a little apprehensive re the stairs, they were well worth the ascents and declines during our stay though we did try to minimise trips up and down to the car upon arrival and departure. (Note that you can arrange to have help upon arrival). Visiting in late October/early November, the cottage also comes with its very own wood burner but we found the heating was more than enough and whilst tastefully decorated in a coastal style, it didn’t feel ‘cool’ as some beach styles can. In fact, the cottage was bright but warm and cosy thanks to blankets and soft furnishings with simple white and nautical themed accessories. A DVD and some DVDs are provided for you, along with games, though as you can imagine the wifi signal and telephone signal can be hit and miss. I did have one work call to do on my frist day but if you are planning to work from the cottage, you may have to be prepared to work this around signal availability. Otherwise, a great excuse to ban all gadgets – you are on holiday after all! I’m not sure what I expected from it but there was something amazing about being able to open the door and head out to the beach for a quick dog walk. Most mornings we were up to see the sunrise and spent several hours watching the sunrise and sunsets (dare I say many of these were with PJs and wellies on!). The perfect dose of beach life to make us slow down, relax and take time out from a few busy months workwise. Whether you are a group of friends, a couple or family – the cottage has lots of space. You’ll find a huge huge kitchen filled with everything you’d expect in self-catering accommodation and I took a particular liking to the huge amount of storage for coats, wetsuits and wellies. There is a large kitchen table and additional sofa chair – perfect for those family based dinners and offering a further room to relax in. We did take dog bowls with us but bar clothes and toiletries, everything else is provided (including linen and towels). Oh and whilst no washing machine, there was a dishwasher! Did I forget to mention the beach huts? Armed with a new DSLR camera (thanks to Julie Christie from Tea Break Tog for the recommendation and push to start photography), I couldn’t wait to test it out on the beach and sunsets. As a beach hut owner I was thrilled to see these gorgeous blue and white huts right next door (and being used in November!). Serious Beach Hut owner envy and I must return to hire one!! 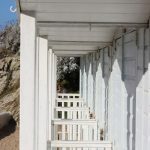 A beach hut enthusiast, beach lovers, photographers, dog owners, families and couples… really who isn’t going to love this place and each one will have their own favourite time of the year to visit!!! This year I’ve been so lucky to be in Cornwall in both March and November and had fantastic weather. 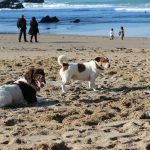 Don’t rule out a Cornwall holiday outside of the summer season – you can get great rates and it opens up possibilities if you are a dog owner. Out of the six days – we had lovely sunshine on several with two really damp, rainy days. I was ridiculously happy to find out that on our very last night they restaurant would be having a beach bonfire – my first!! The dogs were happy indoors during fireworks and then we were happy out on the beach around the fire, followed by hot chocolate (spot the hot chocolate theme during our holiday!). 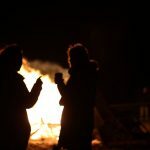 Seriously, though, if you do need to be constantly busy and “out and about” then the cottage won’t’ be for you out of season – I can see that cabin fever could hit if you spend too many days between the cottage and the beach and never venturing afield. However, there is so much to do in the area and during our few days we ventured a little further to some of our favourite beaches (Crantock, Fistral and Watergate Bay). 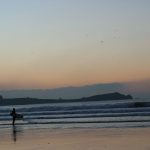 All within a 15-minute drive of Lusty Glaze Beach Cottage and all dog-friendly. 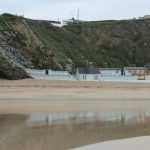 Lusty Glaze beach is just a few minutes away Newquay centre and at very low tide, you can walk to Newquay along the beach. Whilst it’s smaller than its neighbouring beaches, the beach itself felt sheltered from the wind due to the natural amphitheatre of 200ft cliffs. Whilst privately owned, the beach is fully open to the public at no cost and despite the fact that we booked for late Autumn, each day we had a steady but small stream of dog walkers and surfers making the most of some great mild weather. The Lusty Glaze restaurant is open all year round and we had to indulge in one of their famous hot chocolates one afternoon in front of the fire. The staff were really welcoming and I can see how you could easily spend several hours in here with great views, books, games and a glass of two of vino! During the summer months, whilst there is a seasonal dog ban (aka use your lead) from 31st May to 30th September (dogs are allowed in the bar and restaurant all year round), the beach turns into a great family destination, with an adventure centre with activities such as climbing and abseiling, bungee jumping, surfing and other watersports offered. The beach management also organises a number of events throughout the summer including live music events. Book early – July and August already look fully booked along with weekends. Or have a snoop around on various social media sites – you may even spot our own collage from our visit!